Pimlico is not the most obvious of gastronomic hotspots; in fact, until last weekend I’d considered this hinterland between Victoria coach station and Sloane Square as somewhere offering little more than pricey interior design boutiques and the odd Made in Chelsea cast member. But while I did come across both these things on my recent visit to the area, I also discovered a new favourite place for brunch in the shape of No. 11 Pimlico Road. Other than the sweeping, curved bar running the length of the restaurant and its inventive cocktail list (Plum Sour or Rhubarb and Apple Rum Punch, anyone? ), there are no traces of the gastropub that inhabited the building until last year. 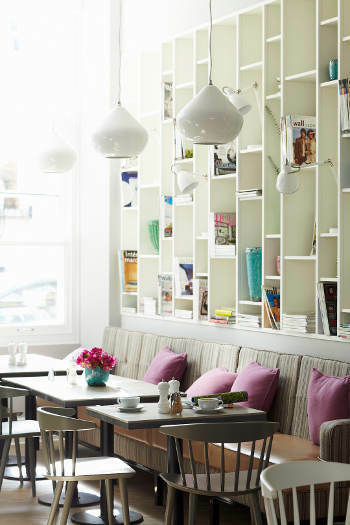 Instead, lots of white-painted wood, freshly cut flowers, natural light and pastel fabrics create an elegant, feminine interior, while the eclectic mid-century seating and pendant lamps nod to Pimlico Road’s Design District credentials. 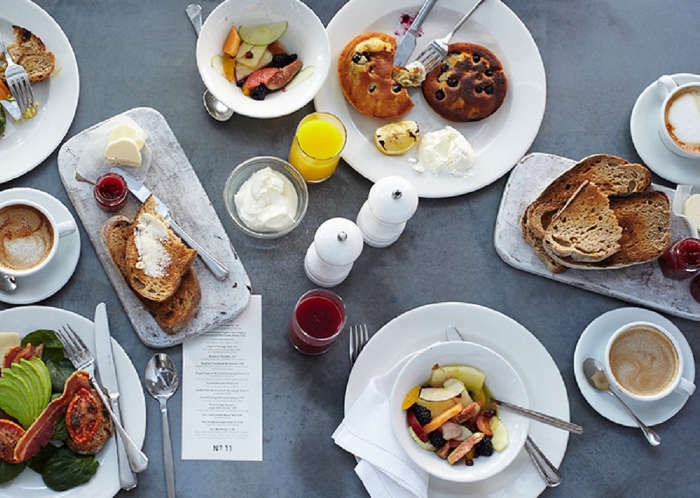 Then there’s the all-important menu – a mix of brunch classics, served all day, and light, brasserie-style dishes such as steamed mussels, roast lemon sole and open sandwiches. I opted for one of the latter, topped with burrata and rocket. The peppery leaves and gooey, cream-infused mozzarella on two slices of toasted sourdough made a mouth-watering match. Portions were generous, but still I couldn’t resist adding a side of ‘guacamole salad’ – a deconstructed take on the dip using slivers of nutty, buttery avocado, spring onions, red chilli and fresh coriander. Usually one to deliberate between Eggs Royale and Florentine, my fellow bruncher was delighted to find No. 11’s Royale features both wilted spinach and smoked salmon, along with two perfectly poached eggs. Washed down with that rarest of things, a not-too-sickly-sweet Bellini, and espressos using coffee beans from the Caravan roastery in Exmouth Market, it was the perfect start to a Saturday browsing (aka looking longingly and mentally decorating my fantasy flat) the neighbouring antiques shops and farmer’s market. Sunday mornings are the new Saturday nights, right? Well, that’s what they’re going for at Bluebird with their live DJ, cocktail-fuelled brunch parties, now running the first Sunday of each month. A make-your-own Bloody Mary trolley and DIY Eton Mess supply the fun factor, while decadent dishes such as SW3 Eggs (asparagus, dorset crab, truffle hollandaise and poached eggs) and Lobster Benedict remind us that we’re very much in Chelsea, darling. Momo’s Sunday brunches are teamed with cinema screenings in the downstairs lounge. Head Chef Philippe Agnello puts a North African spin on the Full English with coco beans in charmoula sauce, merguez, garlic mushroom, stuffed tomato and poached free-range eggs, all cooked in a tagine. Then there are hot mint teas, North-African Bloody Momos and a selection of homemade snacks to graze on during the film. And now for something completely different: brunch at a Japanese ramen bar. The new Sunday menu at Flesh & Buns is billed as both boozy and bottomless. This means unlimited small plates (think beef tataki and Kimchi cheddar aranchini, as well as sushi rolls and sashimi), a signature ‘Flesh’ in – you guessed it – a bread bun (crispy piglet belly with mustard miso, crispy duck leg with sour plum soy, salmon teriyaki with lemon and sea salt or half young chicken with yuzu kosho rub), dessert (kinako doughnuts with black sugar custard or black sesame crème brulee), and drinks (Prosecco, red or white wine plus a welcome cocktail), all for £29 per head.